4 1. How much internal memory is the Honor 8 Pro equipped with? 5 2. The Honor 8 Pro in India will only be available on Amazon? 6 3. Which of these is NOT a feature of the Honor 8 Pro? 7 4. The Honor 8 Pro comes with VR cardboard crafted into its box. What does VR stand for in this context? 8 5. What is the capacity of Honor 8 Pro’s battery? Hi Guys, Hope You are enjoying our tricks. Today we are back with new quiz contest from Amazon. 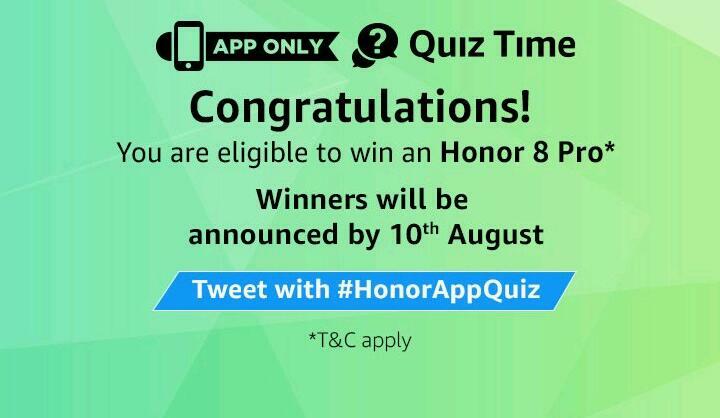 In this Quiz Time They Are Giving Away Free 10 Honor 8 Pro Smartphones. All answers of this quiz are given below! If you answer all the quiz questions correctly, you will be entitled for a lucky draw which will be carried out amongst participants who have answered that particular question correctly. A total of 10 (Ten) participants will be selected as winners of the Contest who answer all 5 (Five) questions correctly. We are already published previous Amazon quiz time contest answers for contest like Amazon Nokia 6 Quiz. 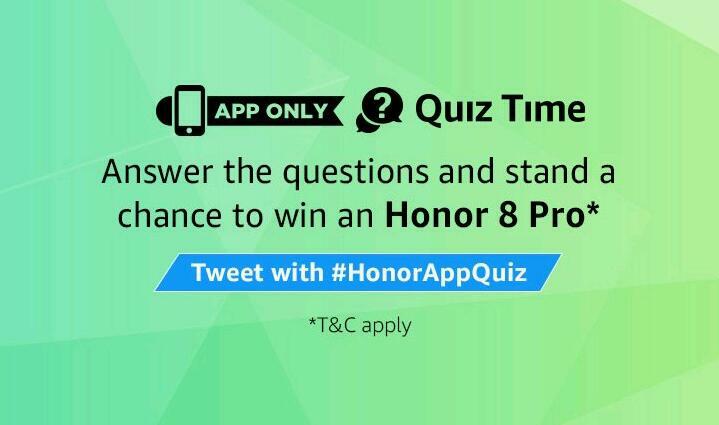 Here Amazon Is Again Comes Back With Another Quiz, This Time They are Giving Away Free 10 Huawei Honor 8 Pro Smartphones By Completing The small Quiz. Participate now & Get the answers below ! why not you are lucky this time? 4. Now Just Answer All 5 Questions Carefully , Select The Correct Answers as Given Below! 1. How much internal memory is the Honor 8 Pro equipped with? 2. The Honor 8 Pro in India will only be available on Amazon? 3. Which of these is NOT a feature of the Honor 8 Pro? 4. The Honor 8 Pro comes with VR cardboard crafted into its box. What does VR stand for in this context? 5. What is the capacity of Honor 8 Pro’s battery? That’s it !! Now You Will See Congratulations Banner.